The second week of THE X FACTOR auditions included some very interesting auditions along with some runaway talented memorable ones. Three of the days left the panel of mentors with three instead of four when Paulina Rubio was gone for two days because on one she had a concert, and for the other day she was sick. Simon was also missing on another day. Even so, there was no shortage of harsh critiques by the mentors with Demi and Kelly picking-up pointers from Simon’s typical truthful statements as they delivered some of their own brutal honesty – starting in Los Angeles, CA. 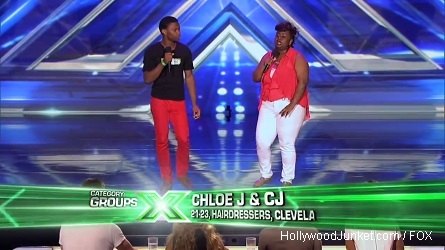 First up were Cynthia (24 years old) and Shirley (16 years old) who sang “I Want You Back” by the Jackson Five. The girls may have possessed the star appearance, but their voices fell flat, as Simon chewed them out for being “one of the worst groups we’ve ever had on the show.” Simon said, “It was like a competition for who could sing the worst. You both win.” What Kelly said may have been more hurtful than Simon’s comment. She told one of them to “come back without your sister.” Simon left things with “I’m going to have to officially break-up Shirley and Cynthia.” The sisters were upset and said that they would not break-up their twosome. Next up, the group Drama, Drama consisting of Michelle, Natalie, Madison, and Jordan (ages 20-24) suffered through a dramatic experience on-stage, unable to coherently explain the meaning behind their group’s name, and then embarrassing themselves through a painful cover of Miley Cyrus’ “Party in the USA.” They said they’d like to be like the Spice Girls. Simon pinpointed it as,”Everything about you right now screams ‘old fashioned’ and it just doesn’t seem real.” Simon said “No” on behalf of all of the judges. YES votes went to: Millie Thrasher, Timmy Thames, Yellow House Canyon, along with other singers who all had brief auditions, and all got four yeses! Simon told Millie “I see huge potential in you.” He told 13-year-old Timmy Thames “I just got this feeling about you right now,” and said he is going to become a star. On “Yellow Hot Canyon,” Simon said, “I like you. I think you have a great spirit.” The other mentors agreed and said they are great people. 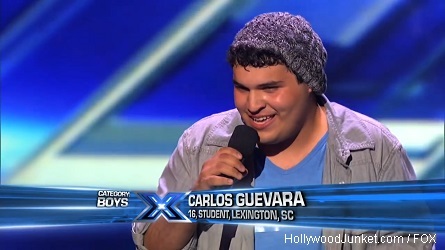 Sixteen-year-old Carlos from Lexington South Carolina has turrets, but he’s not letting it hold him back. He sang “Gravity” by John Mayor. Carlos can sing better than half the contestants that aren’t battling turrets. His energy is contagious and he can defiantly hold a tune. Paulina spoke to Carlos first, “I don’t know you, but I feel really proud of you. You have an amazing voice and great energy.” Kelly said she was so happy to be in that room to witness the performance. Simon told Carlos, “You’re not a victim. You have this issue. Most important is you haven’t let that stop you from doing what you’re doing. You have a great voice.” Four yeses. A Party in the Atmosphere! Memorable X FACTOR Moment – When Chloe kissed Simon on his head and neck! 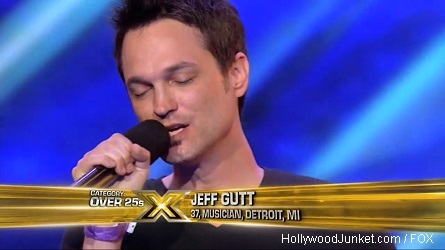 Four or Five more contestants with fast auditions also got to move onto the next rounds. Colton Pack was next up, from a small town in West Virginia called Danese. The town has only one stop sign. 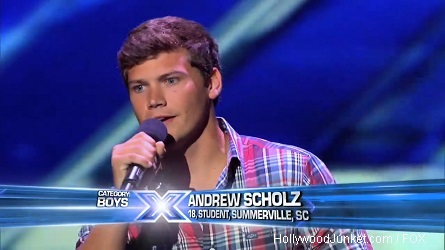 When they heard of his X Factor audition, they rented a charter bus for the whole town to come to support him. Colton claims he’s somewhere in between a good boy and bad. Simon decided bad. Colton dreams of being a country star. Singing ‘Hicktown’ by Jason Aldean. The boy can defiantly sing. Paulina seemed smitten by him. She said, “I like you baby. I love your presence,” then growled at him as if she is a cougar. Demi told him it was pitchy at times but that he has a “natural stage presence.” Simon on the other hand said, “I really, really, really, like you.” He also told him that there is a market for someone like him now and that they mentors can help his vocals get better. Four yeses. 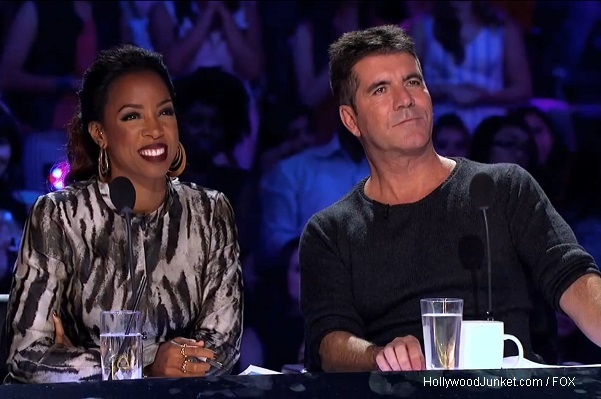 Simon is missing from the next audition. Overall, the night showed us some disasters, but also a lot of talent and this season is shaping up to be an interesting show with a lot of competition. Night two of week two’s auditions started in North Charleston, South Carolina. After he proved to the mentors that he didn’t have any singing talent, Demi said, “You have a look and the girls love it. It was really, really theatrical.” Paulina agreed, “I feel you pose a lot. You study every move.” Simon said, “What kind of singer do you want to be? Blake answered with “R & B”. Simon was perplexed and gave-up on him. They sent him off with a “no” vote. Other auditioners tried to stand-out in lew of having solid talent. Ashylyn got out of a cake. Another contestant sang in Pig Latin. There were so many “no” votes coming from the mentors that Simon wanted to leave and call it a day. Paulina missed another day on her new job when she fell ill. The panel is temporarily left with only three mentors. Santiago is a 16 year old student from San Lorenzo, Ca. She sang “Wings”. It was all quite and cute coming from her while speaking to the mentors. 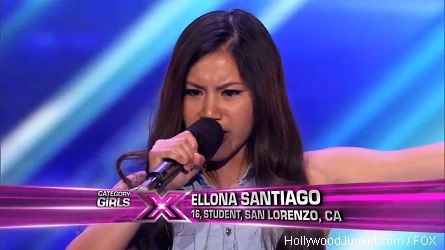 But, once the music started, Ellona had a totally different personality which showcased calm and confidence. 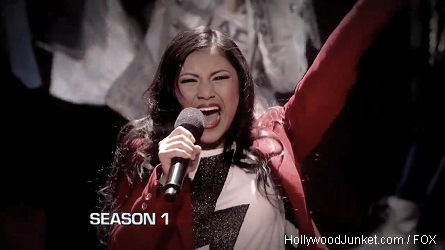 Memorable X FACTOR Moment – Simon knew her as “the girl in the red jacket” from season one. 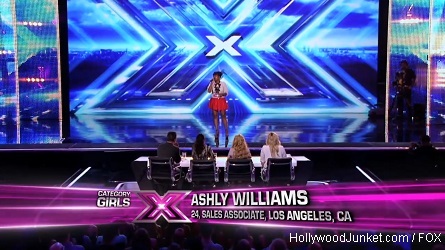 The most impactful audition of the night came from 24 year old Ashly Williams from Los Angeles whose Mother was murdered when Ashly was only fourteen-years-old. She sang Whitney Houston’s “I Will Always Love You,” in a way we are sure was dedicated to her mother. Kelly told here, “Its funny you are saying thank you to everybody. But thank you baby girl for spilling your heart out in that vocal.” Paulina reacted with, “That was an amazing performance.” Demi was speechless and said she had, “chills all over my arms and legs. There’s a place in the market for you said Demi. Simon rejoiced in his American market by saying, “This is why we brought the show to America is to find someone like you. I think we just scratched the surface with you. Because you are seriously good.” Demi called first debts on Ashly when she said wants to mentor Ashly.